* Transform your board into a strong, God-honoring, and energetic body that's equipped to execute a dynamic plan for the future! Offering 12 essential principles, a pastor, a not-for-profit board member, and a former university president help you better understand your role, purpose, and mission; encourage promising leaders; embrace vision-motivated change; and more. 192 pages, softcover from Beacon Hill. A local pastor.A long-standing member of not-for-profit board.A former president of a university.These three authors share their wisdom and experiences from decades of board leadership. 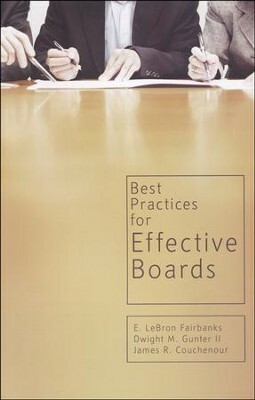 With specific areas of expertise, they bring 3 distinctive voices and perspectives to the 12 essential principles every leader needs to develop and maintain a healthy governing board.Best Practices for Effective Boards challenges your board to become the most effective, God-honoring body to ever serve your organization. Regardless of the size of your board or the organizations that you serve, you can benefit from the principles outlined in this book. The starting point is clear and the path is systematically laid before you, helping to transform your vision, strategy, and future. No matter where you start, you can develop your board into a strong and effective body working toward a future of growth and development.Reviews’Board development is one of the most important, if not difficult tasks for any organization or leader. Without an effective board an organization is unstable and its leader is unaccountable. These three gifted and respected leaders offer some of the best advice available for grounding and advancing a mission through the development of effective boards.’-Tom Nees, President of Lead to Serve’There is no question that any leader will benefit from the thoughtful Best Practice compilation. Looking back on my own career there are many places where I could have applied the principles and ended up more effective and productive. We all should be thankful for the diligence of the authoring team.’-Richard Schubert, Executive VP, Executive Coaching Network, Inc.
E. LEBRON FAIRBANKS retired in 2007 from Mount Vernon Nazarene University after serving 18 years as university president. He is a graduate of Trevecca Nazarene University; has graduate degrees form Scarritt College, Princeton Theological Seminary, and Nazarene Theological Seminary; and pursued post-doctoral studies at Harvard University and Yale University. Prior to his move to Mount Vernon in 1989, Fairbanks served as president of Asia Pacific Nazarene Theological Seminary, Manila, The Philippines, and as academic dean of the European Nazarene College near Schaffausen, Switzerland. He has also served on the faculty of Southern Nazarene University. Fairbanks is an international speaker and author of the modular course of study text, Leading the People of God. Dwight M. Gunter II is a leader with a pastor’s heart and currently serves as Senior Pastor at Trevecca Community Church of the Nazarene. He received a Doctor of Ministry degree from Nazarene Theological Seminary with a special emphasis in pastoral leadership. He and his wife, Karan, live in Nashville, TN. Dr. James Couchenour is the founder and longtime president of Cogun Industries, a construction company specializing in the building of local church and ministry organization facilities. He has formally served as chairman of the Mount Vernon Nazarene University Board, and for years preceding his election as board chairman, served as the chairman of the MVNU Board Buildings and Grounds Committee. He was the founding director of ’The Way Station,’ a compassionate ministry center. He is a frequent speaker at organizations on the subject of board development. I'm the author/artist and I want to review Best Practices for Effective Boards.